Donegal Airport. Photo by Owen Clarke, reproduced with permission from PrivateFly.com. Saba Airport. Photo courtesy of PrivateFly, by Cess Timmers, tvc-advertising.com. 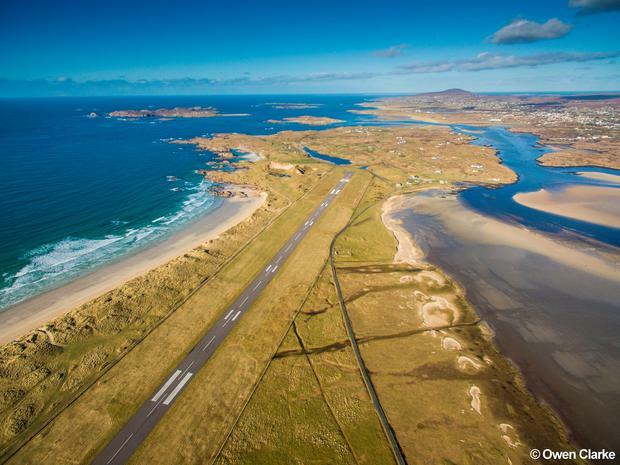 Donegal Airport has topped one of the world's best-known lists of scenic landings - for the second year in a row. The Carrickfinn airport headed the annual poll conducted by private jet booking service PrivateFly, beating off much busier and better-known strips like London City and Toronto's Billy Bishop Airport for 2019. "Most beautiful scenery I ever saw, with the beach on one side with crystal clear water and Mount Errigal standing tall on the other side," one voter said. The poll ranked 129 airports, with thousands of public votes followed by a judging selection overseen by a panel of travel experts, PrivateFly says. "Woohoo!!!" the airport's Twitter account posted. "Management and staff are delighted to have Donegal Airport as the No.1 most scenic airport for the second year. A big thank you to everyone who took the time to vote for Donegal Airport." Just two routes operate from Carrickfinn - to Dublin and Glasgow. "This achievement is a great boost for Co Donegal and for the airport, and is testament to the attractiveness of the county as a destination," said a spokesperson for Stobart Air, which operates the Dublin-Donegal route. Last year, Stobart saw an 11pc increase in passenger numbers on the service, and invested €13.8m in a new ATR42-600 aircraft to operate it. Loganair operates flights between Glasgow and the airport, set about 15 minutes from Gweedore, and a 45-minute drive from Letterkenny. The PrivateFly award comes hot on the heels of another global accolade for a county National Geographic Traveller once dubbed the world's "coolest place". This January, TripAdvisor named Harvey's Point as Ireland's No.1 hotel in its annual Travellers' Choice Awards.